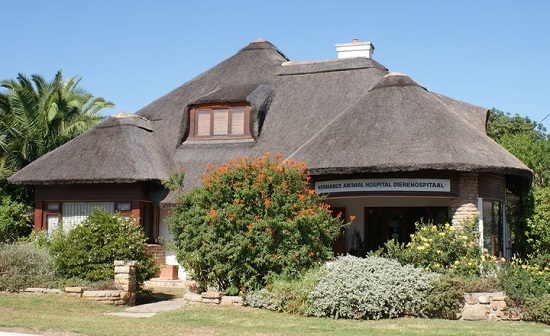 Hermanus Animal Hospital is the oldest veterinary practice in the Overberg. It started 40 years ago as part of Caledon Veterinary Hospital and has grown since to be the largest animal hospital in Hermanus. We offer complete services to small animals, horses, birds, exotic animals, wild life and a small amount of cattle and sheep. Apart from conventional medicine we also practice complementary medicine and offer a choice of alternative therapies. Hermanus Animal Hospital boasts a special interest equine veterinarian as well as a special interest small animal surgery veterinarian. As part of this wonderful coastal community we like to actively get involved where ever we can help to make a difference. Our vets regularly participate in pro hands on education for all ages - from animal talks at primary schools to animal post mortems for matric students. We are actively involved in spayathons, spaying approximately 5 - 15 animals per week. We also do alot of pro-bono work for strays and assist welfare clients when their animals are in need of specialized surgery and/or treatments. HAH regularly sponsors and helps out with pet shows at schools and old age homes.